It has ample parking space a few kilometres from Ntinda in Naalya after Engen petrol station with Shoprite Supermarket and a number of shops specializing in a number of items. On the first floor you find the food court, a pharmacy and the famous Wine Garage for an assortment of wines. FoodCourt - Nawab Authentic Indian Restaurant famous for kebab, Masala chips plus vegetable mix flatter and next to it is Big Mama's Kitchen for Healthy African Food with Chcken, Nyama and goat Muchomo all served with chips costing you about Shs 12,500. Huo Guo follows specializing in chinese cuisine and next to it is Latin King taking care of your pizza needs. However, like all good things, there's a problem of smoke though. Cinema - At the time of our visit, plans were underway of setting up a cinema hall for the movie lovers. Kids - Metroplex Children Play Area is well equipped with an assortment of items to ensure your kids have fun while at Metroplex. It has slides, swings, sand, bouncing castles, toys and a lot more but the kids have to part with at least Shs 5,000 to enjoy the games and rides. Banks - Standard Chartered Bank is yet to open but Diamond Trust Bank is already operational. 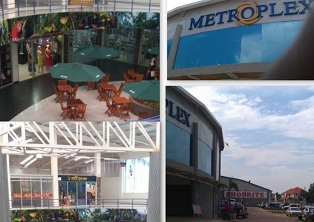 Metropolitan Forex Bureau is just next to Shoprite, adjacent to Bata shoe company. Supermarkets - Shoprite is one of the biggest entities on Metroplex shopping Mall making it a one stop shop for Naalya residents and those using the Northerbypass. Fashion - The mall has lots of fashion shops specializing in trendy outfits, lingerie plus African wear designs. Kids Shops - Babylicsious, Selonie Kids centre are some of the shops on the Metroplex Mall with kids accessories.